Fully featured dynamics. Flexible skins. Two compression curves and limiting. Good metering options. Not an essential purchase. External sidechaining awkward to set up. Potentially complex. 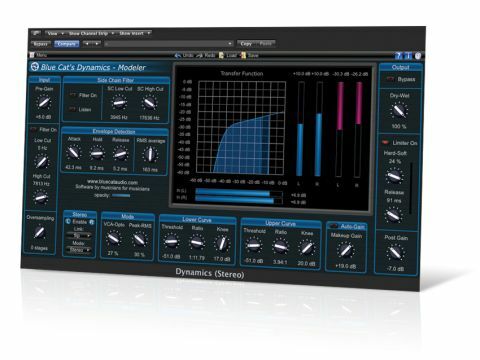 Dynamics 3 is the latest incarnation of Blue Cat Audio's multitalented dynamics plug-in. As well as adding extra features, it's now Mac-compatible. The concept remains the same, with the plug-in able to serve as a compressor, gate, limiter, expander or waveshaper. On top of this, there are mid/side processing, extensive stereo linking options, individual channel enabling and additional display zoom options. On the face of it, it's all pretty standard stuff, but scratch the surface and there are plenty of subtle features that make Dynamics 3 stand out. First up, the compression type is continuously adjustable from VCA to Opto (rather than simply one or the other) and ditto for the envelope detection mode, which ranges from Peak to RMS. You can set the RMS averaging time, too. Control over the shape of the compression curve comes via the Lower Curve and Upper Curve sections, each of which have their own Threshold, Ratio and Knee settings. By increasing its Ratio (from the default of 1:1, ie, no change), the lower part yields downward expansion, with more extreme settings resulting in gating - more unusually, setting a ratio below 1:1 will give upward compression. The upper part of the curve is for straightforward compression or limiting and the Ratio can also be backed off from 1:1, down to 1:2, for upward expansion. You can apply frequency-dependent compression with the onboard sidechain filter or external sources, and there's a wet/dry control for parallel compression. Dynamics 3 sidesteps the subject of internal audio routing by using MIDI CCs to achieve external sidechaining. This means that it's flexible and compatible with most DAWs, but also more complex, requiring Blue Cat's freely downloadable Gain plug-in to work. To achieve basic external sidechaining, you insert Dynamics 3 across the key source track, setting the mix to dry. Next, using the MIDI Output allocation in the Global Settings, you assign a MIDI CC and channel to a suitable parameter - Total Gain is ideal for dynamics. "The plug-in is able to serve as a compressor, gate, limiter, expander or waveshaper." Next, you'd insert the Blue Cat's Gain plug-in across the track you want to process, assigning the MIDI Input to match the corresponding output of Dynamics 3. Finally, you'll need to 'connect' MIDI between the two using whatever routing methods your DAW supplies. Yes, it's a bit complicated, but given that you can link all sorts of parameters from Dynamics 3, it's also extremely powerful. Top and tailing the plug-in are pre- and post-gain controls with high- and low-pass filters at the input, and a limiter at the output. Finally, in exchange for an increased CPU hit, you can apply oversampling to improve audio quality. It's not unusual to see plug-ins with alternative skins, and Dynamics 3 has a few. However, Blue Cat has used this capability to present the plug-in in more focused forms. So, as well as the full-featured factory skin, there are gate; compressor; limiter; gate with graph display; compressor/limiter; and compressor with graph display variants. These are accessed via a menu where you'll also find MIDI input and output settings and options to generate automation data from sources such as compression gain. Dynamics 3 has a lot going on, but once you get going with some basic compression, it's obvious that the underlying engine is spot on. Unsurprisingly, the VCA and Peak combination yields the most brutal results, with a very swift response - with super-fast attack and release settings (both go down to 0ms) moving the plug-in into waveshaper territory. Moving to more subtle compression with the Opto and RMS settings proved great for bass, and the dual curve settings allow for further flexibility. All told, Blue Cat Dynamics 3 is an excellent plug-in for a reasonable price. However, it's quite complex, and to get the best from it, you'll need a good knowledge of dynamics processing. Drum Kit: starting flat then onto VCA compression with Peak envelope and some fast settings. Next, moving through the various stereo-linking options. Move to RMS setting and Opto compression, then onto gating and then some expansion. Finishing with some upward compression. Bass guitar: starting flat then adding compression using RMS style envelope and Opto compression, trying various RMS envelope timings. Moving to VCA then back again for comparison. Moving to Peak envelope and trying various peak settings. Trying the input filters.